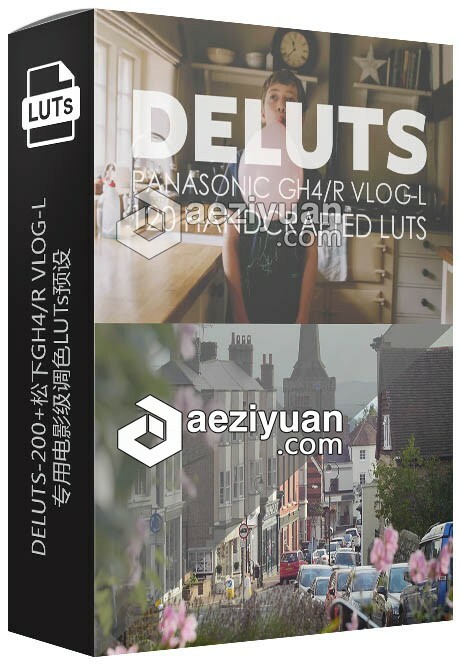 DELUTS-200+松下GH4/R VLOG-L专用电影级调色LUTs预设下载 - 〖LUTs极品调色预设〗 - AE资源素材社区-专业CG素材与教程分享平台 - Powered by Discuz! I have been working on a set of Luts for the GH4/R VLOG-L camera. Its an older camera now having been announced back in February 2014. At that time it was uncommon to have LOG curves in small cameras. At that time I had the Canon 1DC and that having CLOG it was something I really missed from the GH4. Well the wait it just about over and Panasonic have been hard working on VLOG for this camera and its out any day now. I've been shooting with Nick Driftwood over the last few weeks trying to get my head around VLOG-L in person rather than working with 2nd hand media and I must say I really like it. If you have a monitoring screen like the Atomos Shogun then you are able to preview the LUTs whilst you are shooting. This really helps connect you to what you film. Start from the top loading the SSD with all the luts in a folder for neatness. You have 8 slots to flick between and although you load each one at a time try a few standard ones first. DELUTS - VLOG-L AA01.cube, DELUTS - VLOG-L AA02.cube, DELUTS - VLOG-L AA06.cube, DELUTS - VLOG-L AA09.cube, DELUTS - VLOG-L AA10.cube, DELUTS - VLOG-L BB10.cube, DELUTS - VLOG-L CC01.cube, DELUTS - VLOG-L DD29.cube &amp; DELUTS - VLOG-L HH04.cube. They vary in grade and style and many if you know my work have lifted blacks. But there are many in the set with stronger blacks. I produce a lot of creative advertising content and its certainly a very in look at the moment. I'm not one to try and produce a REC709 look from the camera I work with. I'm not saying you shouldn't but its done to taste and what the client wants at the end of the day. Also there are a number of film emulations, well my take on them to discover. As with all luts they should be taken as a starting point to a style, we have so many tools available built in to our popular editors it really makes it much easier than it did even a couple of years ago. When you apply a LUT in Premiere CC 2015 regardless if its in the quick select menu you need to remember a couple of things. The top 'Basic' section is where we load a corrective LUT a 'Technical' LUT and the 'Creative' section is where, you guessed it put our creative LUTs. I'm sure Adobe will make an easy way to add and remove Looks here, a sort of file manager is needed. But for now we load our Creative LUTs here the hard way. The Basic section has control for White Balance (temperature & tint) then we have tone adjustment such as Exposure, Contrast, Highlights, Shadows, Whites, Blacks and Saturation. The Creative section has control for LUT intensity (save you selecting opacity, and even boosts the lut) We also have Faded Film (a kind a way of quickly lifting blacks, but it can go dirty if overused, best to lift the Curve for milky blacks) then Sharpen, Vibrance, Saturation with Shadow and Highlight tint, RGB Curves, Hue Saturation Curve, 3 way colour wheels and Vignette. If you were to load a creative LUT like one of mine into the Basic section and then used any of the controls from that selection or the Creative section to level your exposure you would be altering the image after the LUT, and this is not what we want to do. We need to load the Creative LUT (if its not in the quick select) in this section, then we can use the basic tools to adjust exposure, contrast and white balance. This makes a big difference to working with LUTs. Like I said on older or other editing programs, preform the basic image adjustments before the LUT layer. Same applies here. Its one of the most important thing to consider when working with LUTs. What I do when working on a project is blanket grade with a adjustment layer loaded LUT to get a feel for the footage. If I need to balance exposure between shots I select the clip directly and then use the basic section of Lumetri Color to do that. I then would divide up the adjustment layer and fine tune the LUT from here. Its always a good idea to use Adjustment layers as when things bog down in Premiere you can switch the LUT layer off. When using the Make VLOG simulation LUTs they will already be in the Basic selection dropdown once you have installed the pack. If not these can be loaded here and then just add the creative LUT in the same section.